Is Brexit a mystery to you? Let me say that it is complete mystery to my relatives and a couple of friends that I have in Liverpool here in the UK, where I have been for the past week or so. For my part, I have immersed myself in quality newspapers in order to see more light. Also, I approached two middle-aged chaps in the pub where I am staying. Unlike others I have spoken to, they were up with events and I could hardly stop them talking. They were both Leavers and now of conservative mindsets, though one said he used to be a Labour man. As knowledgeable as they were, they both explained that the deal Mrs May has come up with is unclear to them; as, it became evident, is the so-called “Backstop.” I mention that because of a view among many in the Labour Party, and some in the Conservative Party, that a new referendum is the way to go. The options I have heard about would be three. Remain, leave with no deal, or leave with Mrs May’s deal. I am not sure what would happen if the vote were to be split without any proposal getting 50 percent. Like so much of what I have heard it is nonsense. People in the cities, towns and countryside are simply not equipped to make finely-tuned decisions on complex deals struck in backrooms in Whitehall and Brussels. The referendum’s options was clear: Leave or Remain. Leave won and the three-quarters of the British parliamentarians who wanted Remain to get up have worked assiduously to subvert the process of leaving. 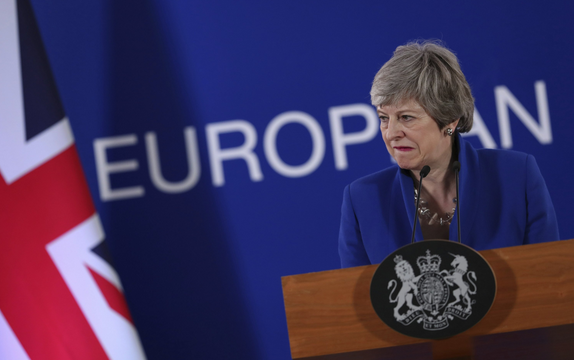 Blame is directed to Mrs May for coming up with her “bad deal,” but the two chaps I spoke to were inclined to blame the BBC, which one called the ABBC (the Anti-British Broadcasting Corporation), and which he said had run an unremitting campaign to undermine the result of the referendum. Half a world away from the ABC, it made me feel at home. As I write Mrs May has just returned from an embarrassing cap-in-hand trip to Brussels with an extension of time. Six months has been graciously given by Macron, Merkel and company. She wanted a shorter period (to 30 June). A longer period to the end of the year had been mooted by Merkel. Macron apparently wanted a very short extension. As it is, the compromise pleases no-one, least of all Brexiteers who fear delay much beyond the upcoming 23 May European elections is code for Remain. Mrs May is holding talks with Jeremy Corbyn, much to the chagrin of Tory Brexiteers. There is only tears in those particular tête-à-têtes. Corbyn is already complaining that Mrs May is not compromising by removing her “red lines”. That means she is insisting the UK must have the ability to strike trade deals with the likes of America and Australia. Corbyn wants a customs union with the EU which would leave the UK bound by any trade deals struck by the EU with no ability to strike its own deals. To boot, he wants the UK to commit to matching all environmental, consumer protection and labour market rules set by the EU. It’s the worst of all worlds. A vassal state, slavishly beholding to the EU with no say in decision-making. What compromises is Corbyn willing to make? None is the likely answer. He’s a Marxist. Enough said. Is the problem insuperable? Some people have the quaint idea that all differences can be reconciled by mutual agreement. This isn’t true. Ask the Israelis. In this case Northern Ireland is the catch. The Good Friday Agreement which ended the Troubles removed all border controls between Northern Ireland and the Republic. Now, how does the UK leave the EU yet preserve that Agreement? What is for sure is that the terms cannot be set out on piece of paper; or they already would have been in the almost three years since the June 2016 referendum. Part of the UK, outside of the EU, would need to trade with the Republic of Ireland as though it were still part of EU, with all of the rules and regulations that come with that. It can’t be done. At least it can’t be done in the form of a formal agreement struck before the UK’s departure from the EU. Hence the Backstop component of Mrs May’s deal, which effectively keeps the UK in a customs union until the EU decides that the position of Northern Ireland and the Republic can be satisfactorily resolved. But it is unresolvable. Mrs May’s deal delivers de facto what Corbyn claims he wants. Mind you, what he really wants is power. All socialists lust for that. So his intent is to make political life as uncomfortable and ungovernable as he can make it. He has little interest in being part of a solution. I’d like to think Mrs May knows that and is playing him. But leave Corbyn aside, Tory Brexiteers are against the deal because it leaves the UK stuck in the EU mire but with no say. Maybe they should accept the deal and live to fight another day, rather than risk a parliamentary decision to revoke Article 50, thus cancelling Brexit. That’s a view here among some well-meaning conservative-minded commentators. Maybe? I believe the best way forward is to crash out. The second-biggest economy in Europe will not be left out in the cold. Once out, the UK could simply declare that it will continue a policy of having free movement across the Irish divide. Then watch the Europeans squirm. What can’t be put down on paper beforehand would be resolved pragmatically afterwards. Of that there is little doubt. The terrible thought that no-one dares articulate is that the forces for Irish reunification will be woken up. Newton formulated a Law that effectively said “To every action, there is a an equal and opposite reaction. Brexit was an action designed by the workers to stand up to the elites who looked down on them. The UNEQUAL reaction of the elites was to prevaricate, wreck the voters will and destroy the lifeline that give the UK a chance to avoid terminal decline. I would suggest that the reaction to the elite’s reaction will increase logarithmically and destroy the elite’s illegitimate hold on power without glory. A couple of corrections to my fifth paragraph: Mrs May wanted until 30 June not 1 June. Some Europeans mooted the desirability of longer delay, until the end of the year. But Macron wanted a very short delay to put pressure on the UK. Such is Macron’s fondness for the English. My revisions didn’t reach the editor’s door in time. I watched the following video with pleasure – and the rebuttal in which the Scottish National Party Remainer Muppet Slave (Alyn Muppet) declares “You do not speak for me, nor the people of the UK …” Umm, yes, the UKIP Leader does as 52% voted to BREXIT. It is the Remainer Muppet Slaves who do not speak for the people of the UK. Over two years ago, the UK Supreme Court ruled that Parliament was the ultimate authority, not some popular vote. It was curtains for Brexit from that point. The general consensus in the comments section appears to be Brexit means Brexit, which is not what a May Brexit means. Maybe the way forward is to forget about the parliamentary quislings, who will never agree on a formula, and find a compliant EU member to vote against any further extension past 31 October . I was hoping Italy may do this on principle but ’twas not to be, so let’s try bribery? Put me down for a pineapple. I have followed up on the suggestion of gardner.peter.d, 13th April 2019, and can see no reference to removal of all border controls between Northern Ireland and the Republic. Admittedly, such a situation may be hidden in legalise but, unless alerted to this, I accept that he is correct and it is a myth. The reestablishment of border controls would therefore threaten the the Good Friday Agreement.